So that's all we've got time for I'm afraid on what was a memorable day for Yorkshire and their supporters. Durham were the last side to win back-to-back titles in 2008 and 2009. Yorkshire have not won consecutive titles since 1968 when they became the last team to win three on the trot, under the captaincy of Brian Close. Our next county cricket live text commentary will be on 19 September for the One-Day Cup final between Gloucestershire and Surrey at Lord's. If you can't wait until then, England are back in action in the fourth ODI against Australia on Friday at Headingley where the series is intriguingly poised at 2-1 in favour of the Aussies. I hope you've enjoyed today's coverage, thank you for joining us. Yorkshire went into the match against Middlesex knowing they needed five points to secure the title, if both their opponents and Notts claimed maximum points. However, the Tykes would also be crowned champions if they bowled Middlesex out for less than 300 and Notts failed to make 350. Ryan Sidebottom took three wickets in the first over of the day to leave the hosts 0-3 at Lord's. The left-armer eventually finished with 5-18 and Tim Bresnan picked up four wickets as Middlesex were skittled for 106 - part one done. Then it was just a waiting game to see how Notts were doing - not very well. They had slumped to 73-7 against Durham and were eventually bowled out for 204. It meant the title returned to Headingley at just after 15:00 BST. Play is over for the day at Trent Bridge, where ultimately the fate of the title was sealed after Notts failed to reach the 350 they needed to keep their slim championship hopes alive. Graham Onions took 5-65 before half-centuries for Mark Stoneman and Scott Borthwick put the visitors in a commanding position. And that is that on an extraordinary day at Lord's when Yorkshire retained their County Championship title. 19 wickets fell in total, but Yorkshire remain favourites to win the match, having built a 132 run lead over Middlesex. Essex put in a solid batting display at Derbyshire where they finished the opening day on 360-6. There were half-centuries for 18-year-old Dan Lawrence (87), Ryan ten Doeschate (88) and Mark Pettini (70 not out) as they look set for maximum batting bonus points. In Cardiff, Glamorgan bowled Kent out for 309, but were in trouble at 65-4 at stumps. Well, shows what I know - they're back out again at Lord's, with seven overs of the day still to be bowled - and Yorkshire's last man Ryan Sidebottom despatches Tim Murtagh to the boundary for the first four of his innings. Maybe not quite as headline-making as Sidebottom's triple-wicket maiden in the first over of the day, but still a shot that is liable to be celebrated in liquid fashion later tonight. Somerset are certainly in the driving seat Anthony. They're only 93 runs behind Hampshire's first innings total with all 10 wickets in hand. The two teams have left the pitch at Lord's and look unlikely to return again tonight. Yorkshire lead by 122 after a hectic day which has seen 19 wickets fall and the visitors claim their second successive county title. Captain Marcus Trescothick and Tom Abell see Somerset safely through to the close of play with the hosts firmly in control in Taunton. With both sides needing a win to keep alive their hopes of avoiding relegation, Hampshire will be hoping for plenty of early wickets on Thursday to keep any first-innings Somerset lead to a minimum. Umpires Steve O'Shaughnessy and Tim Robinson have had their light meters out at Lord's. But the Tykes are batting on. Nine overs left in the day after this one. James Middlebrook is the ninth man out at Lord's as county champions Yorkshire's collapse continues. Having gone from 163-3 to 221-9, given how comfortable they looked at the crease prior to the tea interval, it makes you wonder what the Yorkshire batsmen were supping! Tim Murtagh quickly claims a second victim when he has Steve Patterson caught behind for a fourth-ball duck. Somerset's captain follows fellow opener Tom Abell by registering his half-century at Taunton with a pull off Sean Ervine that goes for four. Hampshire look be struggling to find any inventive ways to find a breakthrough here. Tim Murtagh gets his first wicket of the innings as he jags one back to clip the top of Andrew Hodd's off stump. But county champions Yorkshire now lead by over 100 at Lord's as the visitors move towards the end of one of the most memorable days in their history. 17 wickets in the day now! And still 11 overs to go!!! Somerset edge past 100 as captain Marcus Trescothick sends Ryan McLaren to the boundary. The hosts now trail Hampshire's first innings total by just 137 runs with all 10 wickets remaining. Undoubtedly the happier of the two teams at the moment. Bad light has also brought a halt to proceedings between Nottinghamshire and Durham . The visitors are 121-1, with Mark Stoneman unbeaten on 57. They trail by just 83. A crazy end to the Kent innings saw them collapse from 260-4 to 309 all out against Glamorgan at Cardiff, including four batsmen for ducks. The hosts then lost James Kettlebrough early to fall to 4-1. Bad light has stopped play in Derby, where Essex are 334-5. Ryan ten Doeschate is 82 not out and Mark Pettini is unbeaten on 60. 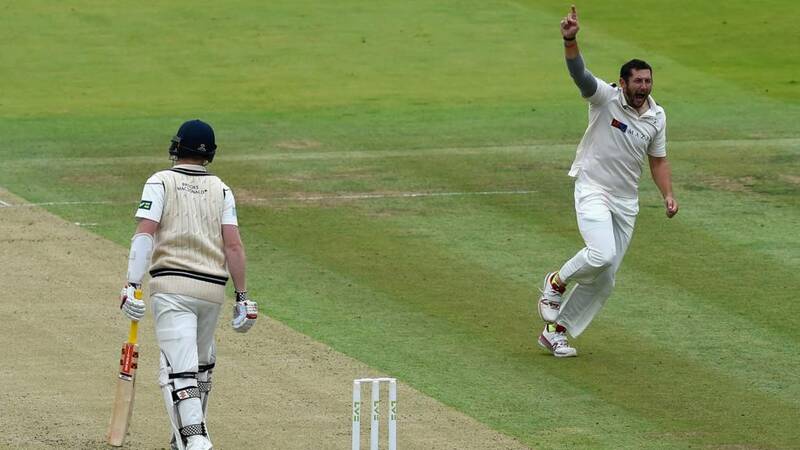 Yorkshire captain Andrew Gale falls just two short of his century at Lord's as Middlesex finally claim their first wicket without the help of the two umpires, after five straight LBWs. Gale, who made a hundred on his last County Championship trip to Lord's in 2013, looked set for another century, having been in fine form, hitting 18 fours before being caught at slip by Sam Robson. That earned former Middlesex captain Neil Dexter his third wicket of the innings. A fine half-century for 21-year-old Somerset opener Tom Abell. Marcus Trescothick, 18 years his senior, is unbeaten on 34 at the other end. Just the start the skipper would have wanted from his side. Middlesex earn their fifth successive lbw decision of the Yorkshire reply as umpire Tim Robinson's finger goes up to give Neil Dexter his second victim. A disappointed-looking England all-rounder Tim Bresnan slopes off. Jack Leaning becomes the fourth Yorkshire man out - all of them leg before wicket - this decision going to Neil Dexter in his final County Championship appearance for Middlesex at Lord's before joining Leicestershire next season. Skipper Andrew Gale remains at the other end, intent on a ton following his personal frustration a year ago when, having been on a two-match suspension, he was not even allowed to lift the Championship trophy. Somerset pass 50 without much alarm as Marcus Trescothick and Tom Abell trade the occasional boundary amongst the dot balls and singles in Taunton. It is pretty slow going but Hampshire will be desperate to pick up a wicket after their afternoon collapse. Glamorgan's Michael Hogan has picked up four wickets to reduce Kent to 295-8 after tea. Darren Stevens is unbeaten on 58. At Derby, Essex are approaching a third batting bonus point against Derbyshire . They're 281-5 with Ryan ten Doeschate 61 not out. Back on after tea at Lord's - and Andrew Gale has already hit four more boundaries in pursuit of what would be the 20th first-class century of his career - and his third of the summer. Notts have finally made a breakthrough after their bowlers took a bit of a pasting as Durham's Jack Burnham is run out for 31. Mark Stoneman is still going strong though, he's 43 not out off 41 balls. Delayed tea interval at Lord's as they catch up on the day's allocation of overs but finally the two Yorkshire batsmen out in the middle, skipper Andrew Gale and Alex Lees, can join their celebrating team-mates back in the away dressing room. With Lees having gone in the last over before the break, Gale will be the happier of the two having reached his half century with his ninth boundary, rapidly followed by his 10th. "Middlesex were all out for 106 just after lunch when Ryan Sidebottom claimed his fifth wicket, three of which had come in the first over of the day. "But the leaden skies have now cleared though and the sun has been out for most of the Yorkshire innings, in which skipper Andrew Gale has reached an unbeaten fifty." Marcus Trescothick and Tom Abell have begun steadily at Taunton for Somerset, whose decision to bowl first this morning is looking like a good one. Hampshire captain James Vince will be hoping for early wickets to put some pressure back on the hosts shoulders. Hopefully the Yorkshire men involved with England's one day party, won't celebrate too hard. There's a series to come back and win against the Aussies lads! Gus was certainly in admiration of Ryan Sidebottom who took three wickets in the first over of the day. Quote Message: Ryan Sidebottom, what a stunning first over that was. The leaders set the right example, set the right tone. Yorkshire have got some outstanding performers and you've got to admire what they've done in the last couple of seasons. Ryan Sidebottom, what a stunning first over that was. The leaders set the right example, set the right tone. Yorkshire have got some outstanding performers and you've got to admire what they've done in the last couple of seasons. Quote Message: Wholesome congratulations (to Yorkshire), it's been an outstanding achievement by them. They've been the best team by a mile. They're the team we all strive to emulate. We've been hit by a juggernaut today. Wholesome congratulations (to Yorkshire), it's been an outstanding achievement by them. They've been the best team by a mile. They're the team we all strive to emulate. We've been hit by a juggernaut today. Alex Lees puts a slight damper on his own teatime celebrations of Yorkshire's second successive title by getting out leg before to Paul Stirling. Durham have got off to a flying start in response to Notts' first innings score of 204. Mark Stoneman has raced to 29 off 22 ball, having sent Luke Wood for a huge six, and Durham are 52-0 after just eight overs. Lancashire already excited at playing their biggest rivals in Division One next season. The Red Rose county won promotion from Division Two at a canter this summer. "Kent's two skippers, county captain Rob Key (94) and first team-captain Sam Northeast (56*), dominated the afternoon session in Cardiff. "Key became one of three wickets for David Lloyd just six short of a ton, while Northeast also reached his half-century before being dropped twice in the same over, but the batsmen rattled along at four runs an over to leave the visitors well placed to take maximum batting bonus points." Looks like the White Rose county will have to wait a bit to get their hands on the County Championship trophy. Teenager Dan Lawrence just missed out on his second century for Essex as he was out for 87. The wickets have been shared among the Derbyshire bowlers, but Ryan ten Doeschate and Mark Pettini are at the crease and looking to take Essex past 300. Former England captain and Yorkshire opener Michael Vaughan kept it short and sweet to express his feelings on Twitter. Jamie Overton grabs his fourth wicket of the match and his third in nine balls as he bowls Liam Dawson for 48. Hampshire are bowled out for a below-par 260, having been 171-3 just after lunch. It was a big afternoon session for Somerset as they picked up eight wickets to swing things in their favour in the race to avoid relegation. County champions Yorkshire, in celebratory mood after confirmation of them retaining their title, have already gone past Middlesex's first innings total inside 22 overs. Captain Andrew Gale, who missed out on the title a year ago when he was suspended, looks in great touch at Lord's, having hit eight fours in his run-a ball 44, while Alex Lees looks well set on 30. Good wishes are even coming from Yorkshire's biggest rivals. Here's Lancashire's head coach Ashley Giles on Twitter. "Nottinghamshire fought back on the first afternoon of their County Championship match against Durham at Trent Bridge, before being bowled out for 204. "Having been put in by the visitors they had lost six wickets during the morning session and it became 73-7 shortly after lunch. "Thoughts of polishing off the rest of the innings were quickly put on hold as Steven Mullaney and Luke Wood set about the rebuilding mission with a stand of 92. "Mullaney had a life on 41 when he was put down in the deep by Barry McCarthy but the young Irishman, making his first class debut, eventually gained his revenge when he trapped Mullaney lbw for 63. "Wood continued to go for his shots, passing 50 for the third time this season on his way to an undefeated 65 but he was left high and dry as the last two wickets fell in quick succession. "Shortly after the home side had brought up an unexpected batting point the innings was closed out by Onions, who bowled both Jake Ball and Harry Gurney in the same over, to finish with five for 56." Quote Message: If you're defending a title, it's always going to be more difficult and more of an achievement. If they go on next year to win a hat-trick of titles, my won't that be an achievement? If you're defending a title, it's always going to be more difficult and more of an achievement. If they go on next year to win a hat-trick of titles, my won't that be an achievement? Quote Message: Yorkshire have won the Championship and the celebrations have started here at Lord's.The crowd start to applaud, the dressing room balcony applaud and skipper Andrew Gale and Alex Lees have shaken hands out in the middle. But the champagne is on ice as there is a game of cricket to be played here. They have won it in style. They have been the best side by a mile. For me it's a better achievement than last year. They've had so many players away with England, so many disruptions. Yorkshire have won the Championship and the celebrations have started here at Lord's.The crowd start to applaud, the dressing room balcony applaud and skipper Andrew Gale and Alex Lees have shaken hands out in the middle. But the champagne is on ice as there is a game of cricket to be played here. They have won it in style. They have been the best side by a mile. For me it's a better achievement than last year. They've had so many players away with England, so many disruptions. News has filtered through to Lord's that Nottinghamshire have been bowled out for 204 and the Yorkshire balcony erupts in celebration. Yorkshire have won back to back County Championship titles and their 33rd in total. It's all over as Harry Gurney attempts a wild swipe and Graham Onions cleans up his stumps. With Notts being bowled out for less than 350, Yorkshire have clinched the title as the White Rose county bowled title rivals Middlesex out for 106 in their Division One match. Graham Onions picks up his fourth wicket of the Notts innings as he clean bowls Jake Ball. After 15 overs of the Yorkshire reply, the visitors now trail by just 38 runs, motoring along at more than four an over. At this rate they'll be into batting bonus points by the end of the day. Two of them would end all debate about where the title is heading. Notts bring up an unlikely first batting point as Luke Wood clubs the ball back past Benny McCarthy for a straight four. 10 minutes until tea and this pair are just starting to settle down. Now, now, that wouldn't be in the spirit of cricket would it Rik?! Durham have decided it's time to try some funky field placings to try and get the final two Notts wickets as wicketkeeper Michael Richardson is pulled from behind the wicket and placed just wide of the slips for an over. It doesn't stop 20-year-old Luke Wood from reaching his 50 off 67 balls with nine fours. A very good innings having come in with his side in deep trouble. Ah, having said that, Hampshire have just lost another wicket against relegation rivals Somerset. Ryan McLaren nicks Craig Overton behind. Hampshire have their first batting bonus point as they bring up the 200 against Somerset at Taunton. Liam Dawson and Ryan McLaren have launched a brief recovery after two wickets in two balls from Jim Allenby. Toby Roland-Jones strikes again with a second lbw decision as Gary Ballance is removed for a third ball duck - his second of the summer at Lord's, having also been out for 0 against New Zealand in the first Test of the summer in May. A fine stand is brought to an end by debutant Barry McCarthy as he traps Steven Mullaney plumb in front with a ball that swung back in. Notts two wickets away from handing Yorkshire the Division One title, will it happen before tea? Just as batting appeared to be getting much easier, Adam Lyth is gone. The England opener is trapped in front by Toby Roland-Jones and up goes the umpire's finger. The White Rose only trail by 61. Steven Mullaney follows up his century against Warwickshire in Notts' last first-class match with a half-century against Durham. The all-rounder brings up his side's 150 at the same time as he crashes Jamie Harrison away for the seventh boundary of his innings. The 29-year-old's partnership with Luke Wood has raced to 77 as Durham struggle to pick up the last three wickets of the hosts innings at Trent Bridge. The whole of Yorkshire continues to hold its breath. Why does that always happen?! A side gets skittled in morning overcast conditions, then the sun comes out in the afternoon?! It's a different contest at Lord's now that the overcast morning conditions have disappeared. Yorkshire's openers Adam Lyth and Alex Lees have looked at ease inside the first six overs. Lyth's four scoring shots have so far all been boundaries. But, in the Yorkshire dressing room, and certainly in the commentary box, most eyes and ears are trained on Trent Bridge where Nottinghamshire, the only team who can now stop the Tykes retaining their title, are rallying on 144-7. Click here to read more about how Yorkshire closed in on the title today. Plenty of resilience being shown by Notts batsmen Steven Mullaney and Luke Wood against Durham. The pair have put on 61 for the eighth wicket so far. Nottinghamshire still odds on to be bowled out for less than 350 though which will hand Yorkshire the title. No hat-trick for Jim Allenby as Ryan McLaren keeps him at bay, but the Australian all-rounder has swung this match in the space of a couple of minutes. Two in two for Jim Allenby and the 32-year-old is on a hat-trick as Luke Ronchi takes a sharp tumbling catch to get rid of Adam Wheater for a golden duck. Hampshire looking in a bit of trouble now. Jim Allenby grabs his second scalp of the afternoon as Sean Ervine is squared up by a delivery and the Zimbabwean walks off before the umpire even has time to raise his finger. Wickets in consecutive overs for Allenby has given Somerset life in this match. England discard Adam Lyth strikes two boundaries in the first over off Tim Murtagh as batting at Lord's is suddenly made to look a lot easier. Certainly a happier return to Lord's for Lyth than on his last visit in mid-July when he was twice caught behind cheaply off Mitchell Starc in the second Ashes Test, the first of them a second-ball duck. Things are a little bit less chaotic in the second division, where Kent have reached 182-2 at Glamorgan with Rob Key (81 not out) closing in on a century. Essex teenager Dan Lawrence has struck his first half-century since his 161 against Surrey in April. They are 128-2 against Derbyshire . Another Hampshire batsman falls in disappointing fashion as Will Smith pushes forward and sends the faintest of edges through to wicketkeeper Luke Ronchi. The bowling change by Marcus Trescothick works wonders for Somerset. Hampshire are edging towards their first bonus point of the innings as Will Smith and Liam Dawson look to rebuild for the visitors once again after the loss of James Vince. Somerset, who were five points ahead of Hampshire at the start of play, have already picked up their first bonus point after taking three wickets. Ryan Sidebottom's return of 5-18 in 12 overs at Lord's was his third 'five for' of the season, taking his campaign haul to 39 Championship wickets in only his ninth match. Not a bad effort for a 37-year-old whose season was curtailed by an early season calf injury which caused him to miss seven matches. He also went past 700 career first-class wickets. Fellow England paceman Tim Bresnan weighed in with 4-30, but it was Sidebottom's triple-wicket maiden at the home of cricket to get this game off to such an amazing start which will most long be remembered. Only a matter of time now, surely. Ryan Sidebottom finishes the Middlesex innings by cleaning up Tim Murtagh. The veteran left-armer finishes with 5-18, and it means Middlesex are now officially out of the title race. All eyes now turn to Trent Bridge, where if Notts are out for less than 350, Yorkshire are champions. Steven Mullaney and Luke Wood are battling hard for Notts taking them to 115-7. They've put on 42 in quick time. The crowd are on their feet (well one man at least) as the home side reach three figures. Tim Murtagh was the man who took them past the 100-mark, with a three off Ryan Sidebottom, followed by a boundary from James Harris. Now on 106-9, Middlesex are just 244 away from the four batting bonus points they need to stay in the title race! Just 11 runs and the vital wicket of James Vince in the first five overs after lunch. Tim Bresnan matches Ryan Sidebottom's four-wicket haul as he traps Toby Roland-Jones leg before second ball. A third bowling bonus point for the Tykes. As soon as Middlesex are all out, and the same happens for third-placed Notts, who are struggling on 97-7 against Durham at Trent Bridge, the reigning champions will have retained their title. Another breakthrough for champions elect Yorkshire at Lord's as Tim Bresnan finds the edge of Middlesex captain James Franklin's bat, Jack Leaning taking the catch at third slip. With third-placed Nottinghamshire also struggling, not long now! Somerset get a vital breakthrough just after lunch and it's Lewis Gregory with the scalp. James Vince goes in almost identical fashion to Michael Carberry as Jim Allenby takes a sharp catch. Another half-century that the Hampshire captain has failed to turn into three figures. First over of the afternoon session just about safely negotiated by Middlesex, James Harris having come in to join James Franklin. Harris edged the final ball of Tim Bresnan's over just short of the slip cordon - but it does not quite compare to the triple wicket maiden with which Ryan Sidebottom started the day at Lord's. We're back under way after lunch and Notts have already lost another wicket to leave them 73-7. Graham Onions has his third for Durham , trapping Brett Hutton lbw. Yorkshire could be champions in the next half hour. By our maths Jim, if Yorkshire bowl out Middlesex for less than 300 and Notts are out for under 350, Yorkshire will be champions. If that doesn't happen, Yorkshire need five points. They've already got two! A decent morning so far for Essex with Dan Lawrence in sight of a half-century. The teenager is 43 not out. Mark Footitt has picked up the only wicket to fall when he bowled Nick Browne. "The wicket of Sean Dickson, chasing a wide one from David Lloyd in the final over before lunch, was a real bonus for Glamorgan in a morning otherwise dominated by Kent. "After Daniel Bell-Drummond was bowled by Michael Hogan early on, Rob Key (61*) and Dickson (59) amassed a partnership of 122 at an impressive rate of more than four an over. "Early signs suggest it was a good toss to win for the visitors to win." "Nottinghamshire struggled against the new ball prowess of Chris Rushworth and Graham Onions on the first morning against Durham. "Both strike bowlers picked up two wickets and there was no respite for the home side at the other end, as Jamie Harrison and Barry McCarthy, a 22-year old debutant, also struck to vindicate Paul Collingwood’s decision to put the hosts in. Rushworth, Division One's top wicket taker, removed Jake Libby in the first over of the day and, when Brendan Taylor drove to point, beaten One-Day Cup semi-finalists Notts were reduced to 1-2 for the second time this week. Steven Mullaney, who replaced Libby at the crease, batted throughout the remainder of the session to move on to 24 at the interval. But he saw four of his colleagues nick the swinging ball through to wicketkeeper Michael Richardson, the last of them captain Chris Read off the last ball before lunch." Good toss to win as reigning champions Yorkshire take seven Middlesex wickets in the morning session, to move within reach of their second successive title. "The toss was always crucial given the 10.30 start times in September, a greenish tinge to the pitch and leaden skies over the capital. "With only five points required to seal their crown at the start of play, Ryan Sidebottom got the visitors off to the perfect start, taking three wickets in the opening over. "He added a fourth before Tim Bresnan nipped in with two, then spinner James Middlebrook struck in the final over before lunch." It's a fifth first-class half-century of the season for James Vince, despite a scratchy start to his innings. The Hampshire captain began to start to find the middle of the bat and hit nine fours on his way to 50. In the battle to avoid relegation between these two sides, Hampshire head to lunch probably the happier of the two teams. "Kent made a positive start after winning the toss with a century stand between club captain Rob Key (61 not out) and South African newcomer Sean Dickson. "Both played attacking shots after Michael Hogan removed Daniel Bell-Drummond in the second over, but Dickson fell to David Lloyd for 59 in the over before lunch." Yorkshire skipper Andrew Gale truly has the Midas touch at Lord's this morning. His decision to opt for an over of spin just before lunch is rewarded when James Middlebrook removes danger man John Simpson with the final ball of the session, earning visiting wicketkeeper Andrew Hodd his third catch. Middlesex wicketkeeper John Simpson has clearly decided that the best form of survival against county champions elect Yorkshire is to match fire with fire. He has so far struck five boundaries in 15 balls on the approach the lunch interval to steer his side to within reach of three figures. That's a second time in three days that writer's curse has struck a side I have said are batting well. Michael Carberry goes for a big flash and only succeeds in edging Jamie Overton behind to Luke Ronchi. Good time to pick up a wicket for Somerset, 10 minutes before lunch. Jamie Harrison has got in on the act at Trent Bridge, removing Chris Read to leave Notts 70-6. Don't forget, if Notts are bowled out for less than 350 and Middlesex fail to reach 300, Yorkshire will be champions. Meanwhile, Essex are 80-1 against Derbyshire and Rob Key and Sean Dickson both have half-centuries for Kent who are 120-1 against Glamorgan. The Yorkshire fans are already celebrating! The 100 is up for Hampshire as James Vince drives Jamie Overton for a couple down the ground. It has been a pretty chanceless session by the visitors, apart from the loss of Jimmy Adams - which was more down to a superb throw from Jamie Overton as opposed to batsman error. Chris Rushworth has another for Durham at Trent Bridge to leave Nottinghamshire 37-5. Samit Patel is the man to go. Bresnan adds a second wicket (and earns Yorkshire a second bowling point) as he removes Middlesex opener Sam Robson. Meanwhile, Former England opener Marcus Trescothick has signed a new one-year contract with Somerset. The 39-year-old was a member of the 2005 Ashes-winning side before his international career was cut short by a stress-related illness. Somerset director of cricket Matthew Maynard said: "Marcus is the absolute model professional. His experience and knowledge are second to none. Spinners Max Waller and Jack Leach and seam bowler Josh Davey have agreed new two-year deals with the county. A rare ripple of morning applause for Middlesex as their 50 comes up in the 16th over of the day, as James Franklin gets off the mark with a boundary off Steve Patterson. It has been a fine morning for Michael Carberry as he reaches his half-century by sending Craig Overton to the boundary for the 10th four of his innings. Put the champagne on ice fellas, as Nottinghamshire are also in big trouble at Trent Bridge. Durham debutant Barry McCarthy has just picked up his first wicket, removing Riki Wessels, to leave Notts 37-4. In Division Two, Kent are 62-1 against Glamorgan and Essex have just lost their first wicket after Nick Browne was bowled by Derbyshire paceman Mark Footitt. They're 48-1. Ryan Sidebottom's hopes of getting all 10 on the first morning against Middlesex at Lord's are ended by another of the Tykes' England pacemen Tim Bresnan, who strikes with the fifth ball of his first over after coming on at the Nursery End for Jack Brooks. Neil Dexter is caught behind, after putting on 30 with opener Sam Robson. Hampshire captain James Vince is living a charmed life in Taunton as the ball flies past his bat on more than one occasion and is lucky not to nick behind. Michael Carberry is finding life at the crease far more easy as he sends Craig Overton for consecutive fours to move into the 40s. If they bowl Middlesex out for less than 300 and Notts fail to reach 350, the White Rose county will be crowned champions. In all reality Yorkshire could be celebrating at the end of today. Jimmy Adams falls in rather strange circumstances as Jamie Overton runs him out with a direct hit from deep extra cover, with Adams going for what looks like an easy third run. A much needed breakthrough for Somerset. Michael Carberry has found his scoring boots after a slow start with 24 of his 31 runs coming in boundaries, with Lewis Gregory feeling the brunt of his early morning aggression. Hampshire are ticking along steadily as they look to escape relegation. I mentioned earlier that Yorkshire needed six points to claim the title, but it appears they only need five, as even if they finish level on points with Middlesex they will claim the title with more wins. It's all academic anyway, but just wanted to get the maths right! Yorkshire's England contingent are certainly enjoying their side's good start. Four wickets for Ryan Sidebottom and Yorkshire have one hand on the County Championship trophy. Stevie Eskinazi edges the 37-year-old to Adam Lyth at second slip and Middlesex are in deep trouble. Yorkshire will be batting before lunch at this rate. The bowlers are certainly making the most of the cloudy overhead conditions. At Trent Bridge, Notts are now 7-3 against Durham , with Graham Onions picking up a couple of wickets. Kent have also lost Daniel Bell-Drummond early in their match against Glamorgan - they're 23-1. No such alarms at Taunton as Hampshire tentatively ease themselves into the match. Just one run has come off the bat so far with eight leg byes having been conceded between opening bowling pair Craig Overton and Lewis Gregory. What a baptism of fire this is for Middlesex debutant Stevie Eskinazi. The 21-year-old is now at the crease after those three wickets in the first over. It's going to be a tough test, that's for sure. Three have gone in the first over! I can't quite believe this. Ryan Sidebottom bowls Dawid Malan first ball. Erm, we could be crowning Yorkshire champions sooner than we thought! It's Ryan Sidebottom again - Nick Compton edges him behind. Ryan Sidebottom has removed Paul Stirling, lbw, with just the third ball of the morning at a very overcast Lord's. That's his 700th wicket in first-class cricket as well. What a start for Yorkshire. We have our first wicket of the day ladies and gentlemen. And it's that man Chris Rushworth again! Jake Libby is the man to go, caught by Gordon Muchall. I said it would be a short delay...well the teams are on their way to the middle. It looks like we're in for a short delay at Lord's because the light isn't quite good enough to start. Don't think it'll be too long before we get under way though. Derbyshire will bowl first after winning the toss. Kent win the toss and are the only team to choose to bat today. Fresh from signing a new one-year deal with Durham, Paul Collingwood has won the toss and elected to bowl. Despite Yorkshire losing several players to the England fold this summer, they're still on the verge of the title. Why do you think the White Rose county has been so successful for the second season running? Is it the coach, the captain, their fast bowling riches? In the big game down at the bottom of Division One Marcus Trescothick has called the toss correctly and Somerset will bowl first. The news from the middle at Lord's is that Yorkshire have won the toss and elected to bowl first. There's no Jonny Bairstow for the White Rose county, he's on England duty, so Andy Hodd takes the gloves. For Middlesex, 21-year-old wicketkeeper-batsman Stevie Eskinazi makes his debut. While they may only need six points from their final three games, Yorkshire coach Jason Gillespie has urged his side to stay focused. Even if their minds are already on the beach, it'll take something of a miracle to miss out from this point...but you can read more about what Mr Gillespie had to say here. As well as the game at the 'home of cricket' there's also a huge clash at Taunton where relegation rivals Somerset take on Hampshire. Just five points separate Hampshire in eighth and a relegation spot and their West Country opponents who sit in seventh. It's been quite a season for the reigning County Champions Yorkshire. Unbeaten, with nine wins and four draws, Andrew Gale's side need just six points to win back to back titles. Today, they start their quest at Lord's against Middlesex. Welcome to our live text coverage of the next round of County Championship fixtures.